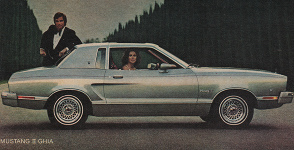 The 1975 Special Silver Ghia Mustang II was a special options package called the Silver Luxury Group added to the Mustang II Ghia. Features of the Silver Luxury Group includes Silver metallic exterior paint, Silver Normande gran half-vinyl roof, unique hood ornament, cranberry tape stripes, and silver bodyside molding outside. Inside there is an all-Cranberry interior in Velour upholstery, color-keyed sun visors and headlining, center console, wood-tone interior trim, and glass moon-roof. Silver 1975 Mustang II owned by William Sanseverino from Las Vegas, Nevada. This is our featured Attitude Of The Week for the week starting March 27, 2016. William purchased this Mustang II in June of 2015. He says that it is all original with 40k miles; major options are a 302 V8, automatic transmission, A/C, the Silver Luxury Edition package, cast aluminum wheels and trunk luggage rack.